Deploying Spring applications to CloudFoundry.com really is as easy as SpringSource say it is. 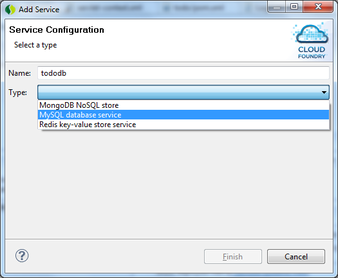 After being approved for a Cloud Foundry beta account, the first stage is to install Cloud Foundry support into STS or Eclipse. Christian Dupuis has an excellent blog post on how to achieve this, so I won’t re-iterate what he has already said. To deploy and run an application using a datasource, MySQL in my case, requires a bit more effort than deploying a standalone application, but literally very little. To deploy an application with a datasource, you must first declare which datasource to use. 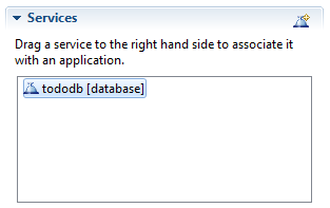 In Eclipse, open up the Cloud Foundry server and press the “Add” button on the services pane. On the following screen, select a name and type for the datasource. Press the “Finish” button and the datasource is registered. After registering a datasource, you need to tell the application which datasource to use. This is as straightforward as dragging the datasource onto the “Application Services” panel for the Cloud Foundry server. That’s all the configuration that is needed for the server. Before deploying an application though, a couple of changes are needed to specify which datasource is required. Because I’m deploying a Spring application, I need to change the application context file to point to the new Cloud Foundry database rather than a local database. The nice thing about using a Cloud Foundry database is that database credentials are not needed, all that is needed is to change the datasource bean configuration in the servlet-context.xml file. Spring 3.1 contains a new profiles feature to allow both of these configurations to be stored within the same context file. On Spring 3 however this feature is not available so the context file needs to either contain the regular bean dataSource definition or the new cloud data-source definition. To access the new cloud tag, the servlet-context.xml needs changing to access the cloud namespace. 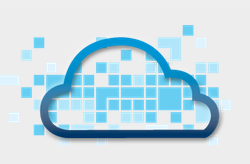 To deploy the application, one final change is needed to add Cloud Foundry support. This is achieved by adding a dependency to Cloud Foundry in the applications pom.xml file. After making these changes, the Cloud Foundry application can be deployed and started and stopped using the controls within STS.